The San Luis Police Department will be conducting a DUI Enforcement Detail and (STEP) Traffic Enforcement Detail as part of the 2018 holiday season. The details will start on the December 5, 2018 till December 8th, 2018 in efforts to detect, stop, and arrest alcohol and drug-impaired drivers and conduct traffic enforcement activities to promote safe and attentive driving. Funding for these special details is provided through a grant awarded by the Arizona Governor’s Office of Highway Safety. 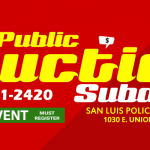 These funds help the San Luis Police Department to increase the number of officers on patrol throughout the City of San Luis with the goal of significantly minimizing the number of traffic related incidents. The San Luis Police Department would like to encourage all residents of the City of San Luis and visiting citizens to be safe and conscious drivers this holiday season. If you plan to drink alcoholic beverages, please use a designated sober driver.